Whew! 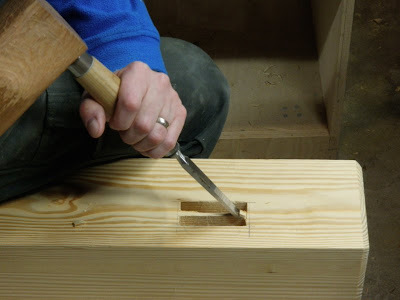 8 mortises. 8 hours. Between work and the Thanksgiving holidays, not a lot of opportunities to work on them. But with perseverance, done. The mortises are big, which accounts for part of the long time. However, because I didn't have a chisel of the full width, it meant the walls would creep inward as I worked down. This required a lot of cleanup during the fitting stage. On the last one, I tried a slightly different technique, two narrower parallel mortises that left better outer walls. This required less fine cleanup, and was a bit faster overall. Cleaning up the web left in the middle. This took about 30 seconds. Finally, a major milestone: the dry fit of the base. 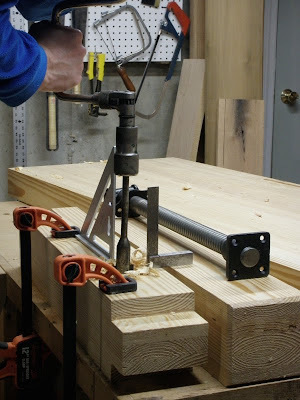 Next, time to bore the holes for the leg vise screw and holdfasts. 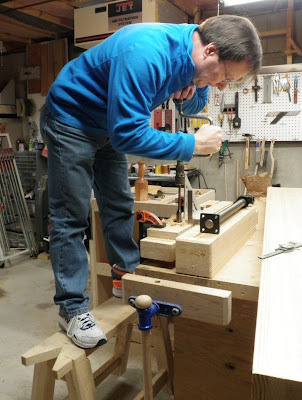 Another use for the Schwarz sawbench. 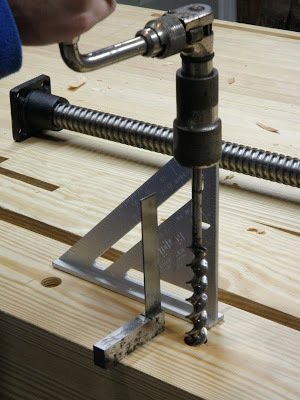 I don't have a bit large enough for the vise screw, so I used an adjustable bit. With only one cutting edge and a large diameter, this is fairly hard. See if you can spot the nasty flaw in my alignment guides. 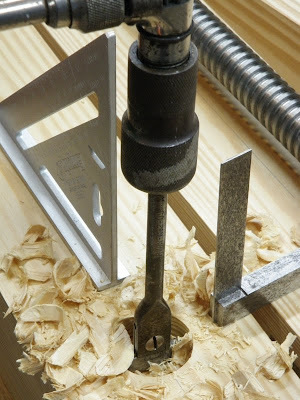 Paring the edge to fit the flared screw flange. I bored the holdfast holes with a smaller fixed-size bit. This was much easier. After doing the front side of the first two, I noticed my alignment mistake. The corrected setup. I was referencing the squares edge-on, not face-on. Turning them both 90 degrees gave me the correct sighting references. 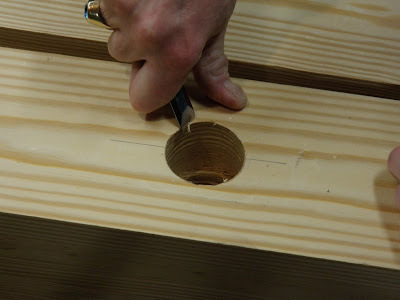 The carpenter's speed square had a definite sideways lean (the result of dropping it on the floor and flaring the corner of the base, plus it's just not made to be an accurate reference on that axis): after boring from the back side, one of the holes was a good 1/8" off center when it met in the middle. Some cleanup with a gouge and cylindrical surform rasp cleared the through-holes so the holdfast shank would fit. 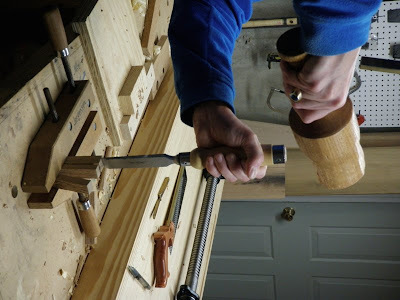 The final task before assembly: making the oak pegs for the drawbored mortise and tenons. 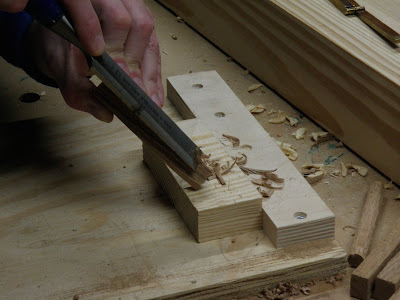 The base requires 2 pegs per tenon, for a total of 16. 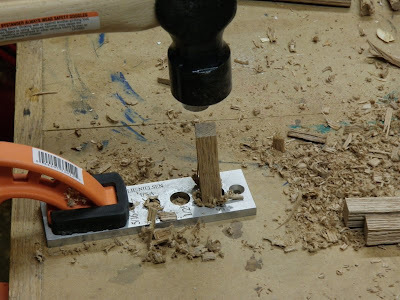 Riving out the pegs from some bone dry oak scraps. 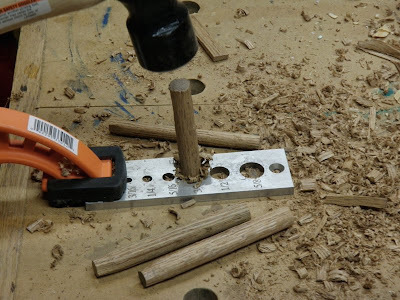 Tapering the end of a peg blank to fit the first hole in the dowel plate. What do you get when you drive a square peg through a round hole? A round peg! What about when you drive a round peg through a smaller hole? A smaller round peg! The final stage through the plate after going through the previous two holes. 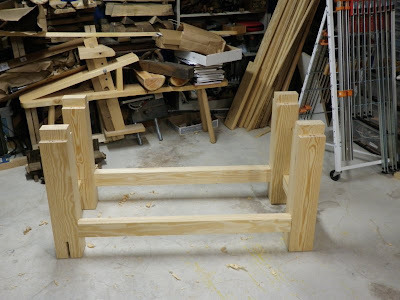 In addition to the one that got away as the end shot through the dowel plate, the ones that were destroyed in the process, and the ones that turned out to have some turning grain (resulting in bowed pegs), this took 2 hours. For someone not used to swinging a hammer repeatedly, it was one of the hardest physical tasks so far. Can you say "repetitive strain injury"? I had to use both hands to hold the hammer for the last few. My forearm throbbed, and my elbow will probably be sore for several days. This is also the time for eye and ear protection, with all the ragged chips flying off the peg and loud pounding (not a good idea while someone's trying to sleep upstairs!). This is something best spread over the project rather than done all at once. Makes me think of the days of wooden ships and iron men. The shipwrights pegged all the hull planks with "treenails", large oaken pegs. Someone had to make those things by the thousands.